Poetry Publication and Florida Blizzards! I love writing contests. Well, I love them when I win. Otherwise I try to be pretty neutral about them, given that writers everywhere have submitted to countless contests for eons, it's just part of the landscape. You look down the road and hope for good weather but try not to be too disappointed when … Continue reading Poetry Publication and Florida Blizzards! Enter your email address to follow this blog and receive notifications of new posts by email. Check out my Darth Vader Disaster post. Read along and totally snicker at my attempt to yield THE FORCE as well as a waffle maker! For my latest feature article visit PinkPlayMags. 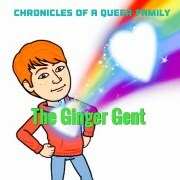 For my latest post on the queer parenting blog visit The Ginger Gent. The adventures of a queer parent, or any parent for that matter are often challenging, joyful, exhausting and most times all three in the same day! This has been my adventure with my seven year old son chronicled here. Weird Science Hurrah! With a difficult year in grade one The Gent scored an amazing win he can be proud of!